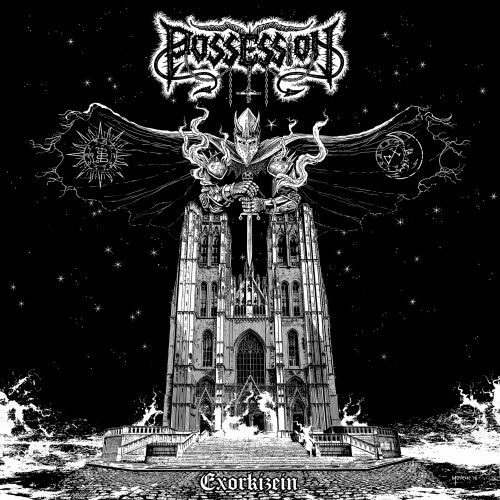 Belgium’s Possession are a rare band, one who established a distinctive, unholy presence with their very first release and whose music has only become even more interesting in a relatively short span of years. After establishing a beachhead with their 2013 debut demo His Best Deceit, they advanced forward with the Anneliese EP in 2014 (reviewed here) and the 1585-1646 EP in 2015 (reviewed here). And now we come at last to the band’s first full-length effort, Exorkizein, created by a line-up that now includes a new vocalist and a new bassist. The album will be jointly released by Invictus Productions and Iron Bonehead Productions on April 7. Two striking tracks from the album, “Infestation – Manifestation – Possession” and “In Vain“, have already debuted, and today we bring you a third one — “Beast of Prey“. “We start writing about him before his death, but it seems that Evil was once again on our side, as the exorcist died while we were still writing lyrics. We changed the lyrics in regards of that event. That first advance track, “Infestation – Manifestation – Possession”, was described by the band as an explanation of the three steps of demonic possession: “As written in the holy book of exorcism, demoniac possession comes by progressive steps …when the last one is complete, it is already too late…” The music captured the song’s thematic inspiration in gripping fashion, with eerie, pestilential melody, deranged vocal extremity, and riffs that slash and strike with barbarous intent. It hits like a combination of thunderstorm and cyclone, devastatingly grim but adrenaline-triggering as well. Musically, “Beast of Prey” is no less savage, and no less engrossing, than the track which precedes it. Its appeal is rooted in the fact that the song has more dimensions than simply the surge of feral power — though that alone is enough to lift you off your feet. The music strikes in a torrent of slashing, abrasive riffs and punishing drum strafing, and new vocalist Viriakh delivers a truly wild demonic summoning of scalding shrieks and violent cries. But the music has a grim and preternatural aura that surrounds the violence. Tendrils of arcane melody spiral through the storm of barbarity, and apocalyptic chords toll like bells of doom, while a deep bass pulse resembling the beat of a leviathan heart mixes in with the hammering rhythms. At the end, distorted choral voices and organ notes convey visions of a solemn, twisted mass being celebrated. Chris Moyen created the thoroughly metal cover art for Exorkizein. It was recorded at Blackout Multimedia with Phorgath (Enthroned, Emptiness). For more info about the release, check these links — and then listen to “Beast of Prey“, as well as the track that premiered first. To listen to “In Vain“, go HERE.